I have been reading a fair amount of non-fiction lately and it was time to get into a good piece of fiction. Make that science fiction. Jake Sullivan watched his father, suffering from a rare condition, collapse and linger in a vegetative state, and he's incredibly paranoid because he inherited that condition. 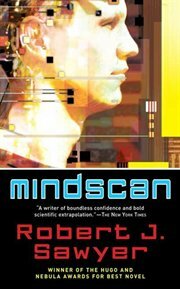 When mindscanning technology becomes available, he has himself scanned, which involves dispatching his biological body to the moon and assuming an android body. Sawyer's treatment of identity issues--of what copying consciousness may mean and how consciousness is defined--finds expression in a good story that is a new meditation on an old sf theme, the meaning of being human. One word of warning if you are thinking about reading this book. Don't read the descriptions on the website of a book company's or library. Ignore the description on the book jacket. They all explain most of the plot of the story. How dumb is that? Even dumber for a book like this. This is excellent science fiction with a very interesting story. Mindscan is a new technology only affordable to the extremely rich. The mind is not transfered but copied into an artificial life form. The life form continues life on earth and will likely live forever, while the original body, known as a "shedskin", is sent to an ultra luxury resort to live out its final days. The story is the complications that come along with that. The concept got me to thinking if I could do it, would I have my brain copied to an android form? I would have to say no. It's not like my mind is transferred from my worn out body to a better form and I go on living life. Instead my copied mind, with all its (my) memories, habits, likes and dislikes carries on and lives its own life, while my original mind and body face the ultimate fate. Death. This was an excellent read and I highly recommend it. Just stay away from the spoilers provided by the same people trying to sell the book!